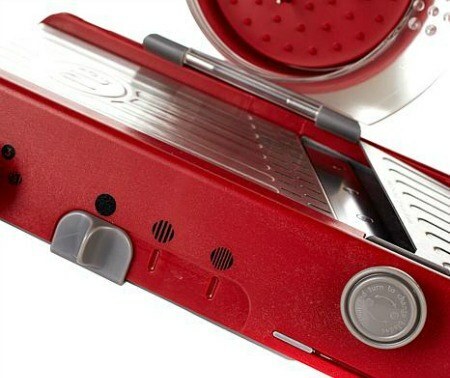 There is no doubt that mandoline slicers are awesome additions to any kitchen, but there are still many cooking fanatics that don’t know how to get the most out of this appliance. Although they are commonly used for slicing, they’re a handy for a variety of different cutting and chopping purposes. 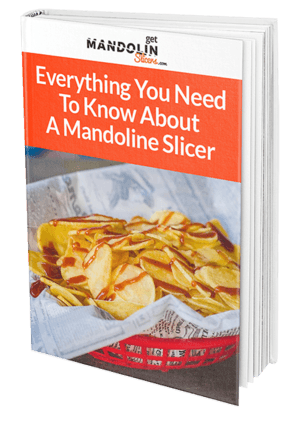 In this article, we will go over different mandoline designs, discuss why mandolines are a great fit for all kitchens, and tell you how to get the most out of a mandoline slicer. Today, there are thousands of different kitchen appliances you can add to your home. They can help you with almost all steps of a meal’s preparation from cooking to cutting and even cleaning up. That being said, mandolines stand out as one of the most versatile appliances because they take care of simple tasks that are present in all kitchens: cutting, slicing, and chopping. Depending on the model you select, you may be able to adjust the thickness of your cut and choose the shape of your slice. Moreover, most models feature a sturdy, ultra-sharp blade that is designed to cut through the thickest foods. Mandolines can be used to cut tough vegetables, legumes, hard and soft fruits, cheeses, meats, and much more. They offer a great alternative for large and small households because they come in a variety of shapes and sizes. Keep in mind that the durability of your slicer will depend on the type you choose, but as a whole, mandolines tend to have long lifespans. The most popular types are made of either stainless steel or plastic and can feature a foldable, flat, or adjustable design. Stainless steel slicers are the most durable type you can find, but they also tend to be more expensive and require some maintenance. Plastic models, on the other hand, are more affordable but are not as tough and can show signs of wear and tear much sooner. There are certain features that can vary depending on the make and model of your mandoline, but they all have a similar mechanism. 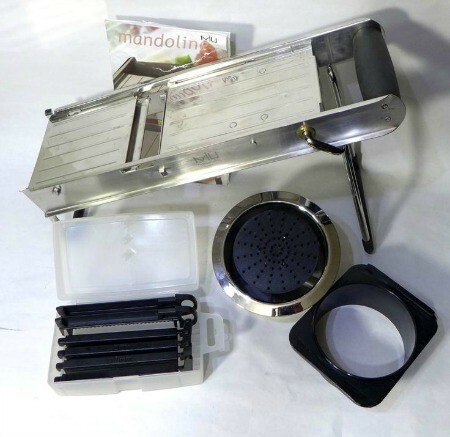 The vast majority of mandoline slicers consist of a main platform, on which you slide foods that are then sliced by a blade at the end of the surface. You can place a plate under your slicer to hold the food you cut, and repeat the process until you have the amount you need to cook a meal. You can adjust the thickness and shape of the cut with different mandolines, so always check out the instructions manual for specific features. One of the best parts about having a slicer is that they are very easy to clean. They usually consist of a small number of large parts, such as the platform, blades, or folding stand. This means you can easily clean them out, but you have to be careful and avoid injuring yourself! Stainless steel models tend to be harder to clean because they require disassembling, but they also tend to be dishwasher-friendly like their plastic counterparts. Mandolines have been around for a while, so there are thousands of different designs to choose from. They are commonly made of plastic and steel, but you can find wooden models and other alternative materials suitable for your specific scenario. As we mentioned before, mandolines are very dynamic and part of the reason why is that they can help cook virtually any meal that requires chopping, cutting, or slicing. Although mashed potatoes are out of the question, you can still make a huge variety of mouthwatering meals. You can use your mandoline slicer to prepare a delicious meal in the form of garlic scalloped potatoes. Because the slices will be exactly the same, your whole meal will cook faster and evenly throughout. Another awesome meal you can prepare to spice up your dinner is a traditional French vegetable gratin. 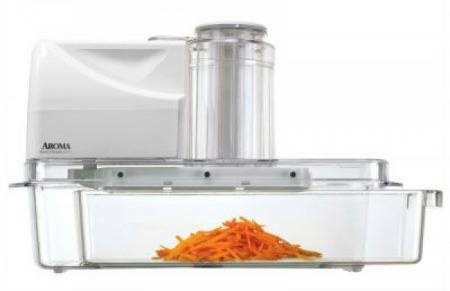 You can significantly reduce preparation time by chopping and cutting all the veggies with your slicer, allowing you to serve your meal in record time. 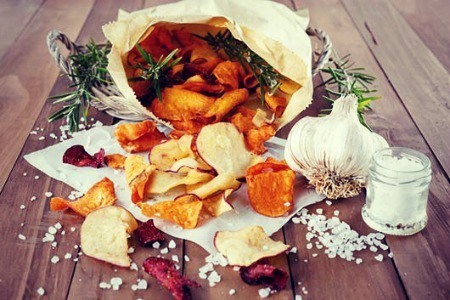 Main dishes aside, you can also prepare popular entrees, snacks, and even desserts that require any type of cutting or chopping by using a reliable mandoline. 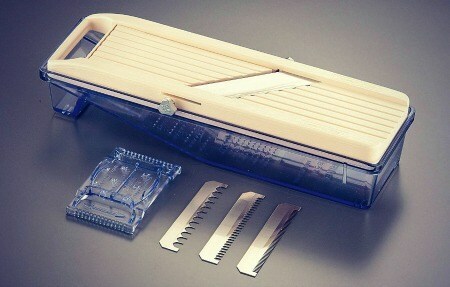 Although they use a similar mechanism, mandoline cutters can come in a variety of shapes, sizes, and makes. Each specific type comes with its own set of features that differentiate them from each other. You should choose the brand and model of your slicer depending on the features you need most. Keep your household in mind as they will ultimately dictate the size of your mandoline. Larger households require bigger appliances, whereas smaller families can opt for lighter models. These are basic models that consist of a static surface that can’t be adjusted or moved. These are often used for large quantities of food that need to be cut in the same shape over and over again. Flat board mandolines are commonly found in commercial kitchens and restaurants because they are capable of cutting an array of different vegetables in the same shape at the same time. But, always keep in mind that these mandolines tend to have more limited functionalities than smaller units. Platform insert mandolines tend to be a lot smaller than their flat board counterparts. Their blades can be adjusted to slice at different thicknesses and shapes, but they are somewhat limited to the inserts that are available. These models tend to be dishwasher friendly, so they make the perfect addition to any kitchen. However, keep in mind that stainless steel models may need to be disassembled before being placed in the dishwasher. As the name indicates, adjustable platform mandoline slicers allow you to select the thickness and shape of your slices easily and efficiently. They are much more versatile than insert models because they depend on a knob to adjust height, so they can help cut paper-thin slices and julienne chunks as well. Other features you may want to look at are foldable stand designs that save space, handheld models, and numerous other varieties that may be a better fit than traditional mandolines. 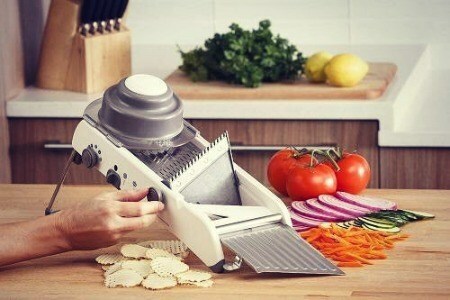 If you just purchased a mandoline slicer, or you simply own one and are afraid to use it, learning how to handle this appliance is extremely important. Although they are awesome tools, they can cause severe injuries so you need to be extremely careful before starting to use yours. As a first step, you should always read the whole user’s manual. Although almost all mandolines work the same way, different models have specific features. You need to get yourself familiarized with your specific mandoline in order to make sure you are getting the most out of it. Having a mandoline is like owning a hybrid between a kitchen appliance and a garage tool, and as any avid DIYer will tell you, tools require some getting used to. Instead of slicing as hard as you can, try to find a nice angle that results in a smooth cut or slice. The slicing platform or main surface is the most important part of your slicer. 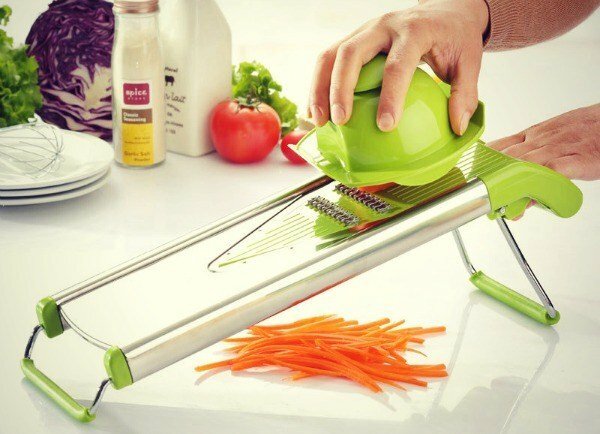 You will have to slice your food up and down in order to work your mandoline, so keep it well lubricated to guarantee the best result each and every single time. 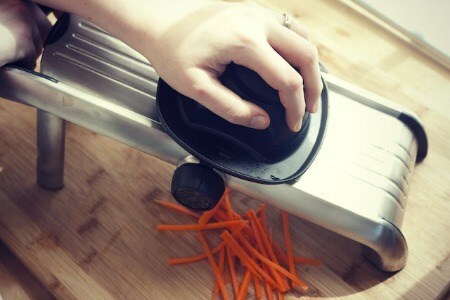 Besides finding the right angle, you have to find a good rhythm to get the most out of your slicer. Slicing at a steady rate will increase energy efficiency, which means you will be required to input less force to get the same results. Hard veggies and cheeses have different consistencies, so you will notice that adjusting your technique and finding the best method will reduce the amount of work and provide better results. The hand guard is designed to prevent you from cutting your hands, so make sure you always use it when utilizing your mandoline. For additional safety, you can also purchase a pair of cut resistant gloves, which are designed to keep your hand safe even if they come in contact with the blade. Owning a mandoline is awesome because it enhances your cooking experience without requiring too much input on your behalf. They are easy to clean, maintain, and can help you create beautiful and delicious meals at the same time. 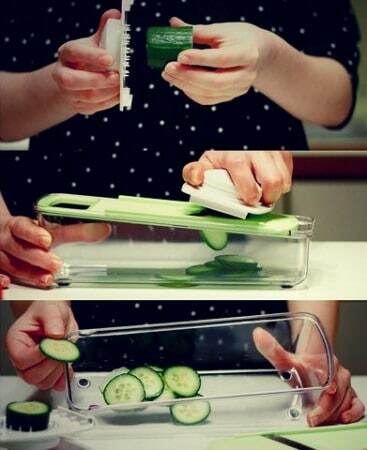 Follow the tips above to make sure you are getting the most out of your mandoline slicer and start creating incredible dishes for your family easily and efficiently.